Pyruvate: an intermediate stage of all kinds of respiration, which is produced from glucose, fatty acid chains or amino acids (deamination). 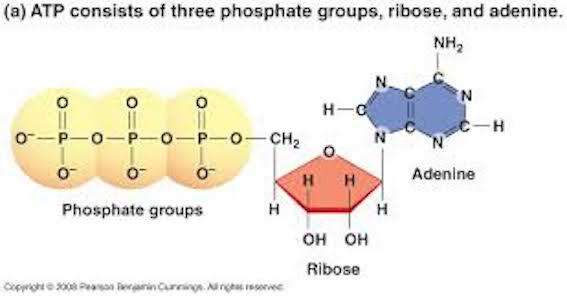 ATP: adenosine tri-phosphate. A cellular energy storage compound. Entry task: Think: What is the difference between ventilation (breathing), and respiration? Respiration is the controlled release of energy from organic compounds, to produce ATP (adenosine tri-phosphate). ATP is a readily available store of energy. This energy can be used in a wide variety of life processes eg. Sodium/Potassium pumps, translation, etc. Moving things within a cell, like the protein fibres that cause muscle contraction. Animation: This is a an animation of a sarcomere ( a muscle cell). 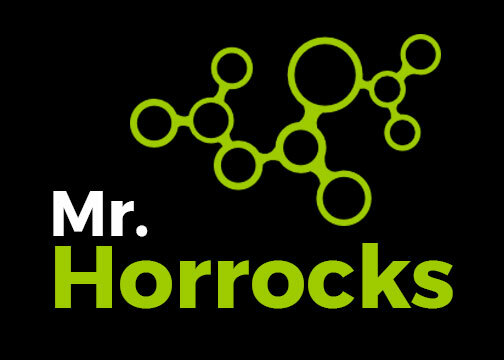 When a muscle contracts, Inside each muscle cell protein fibres slide past each other, causing muscle cells to shorten. This creates a tensile (pulling) force. Anaerobic (in the absence of oxygen). Anaerobic respiration has a lower yield of ATP (energy). Only 2ATP molecules are produced in human anaerobic respiration, compared to 29 ATP molecules in human aerobic respiration. In humans, anaerobic respiration can be thought of an emergency respiration which our muscles adopt when the exercise we are carrying out is so intense that we our cardiovascular system (heart, lungs and blood vessels) simply cannot supply enough oxygen to generate the required energy by aerobic respiration. When this occurs anaerobic respiration produces the energy that we require. However this leads to the build up of lactic acid, leading to acidosis of the muscles. This is painful and eventually leads to the muscles not functioning. In order to remove the acid (H+ particles), aerobic respiration is needed. This requires oxygen. We summarise this process by referring to the generation of an oxygen debt, whenever anaerobic respiration occurs. 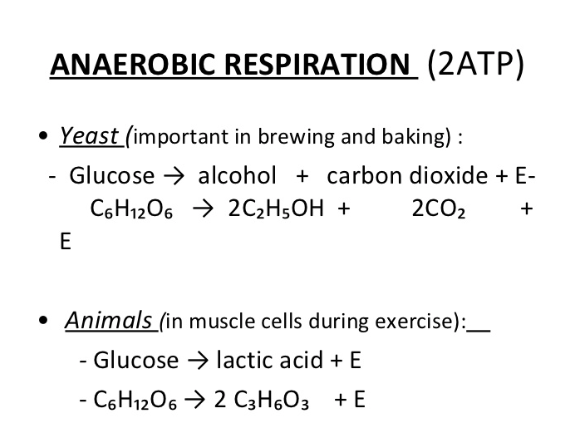 Activity: Follow the powerpoint for a re-cap, write down the equations for anaerobic and aerobic respiration in humans and in yeast and then a challenge.